Well-intentioned leaders, in their attempts to boost innovation, are inadvertently destroying it. What if everything you know about creating a culture of innovation is wrong? What if the way you are measuring innovation is choking it? What if your market research is asking all of the wrong questions? It’s time to innovate the way you innovate. 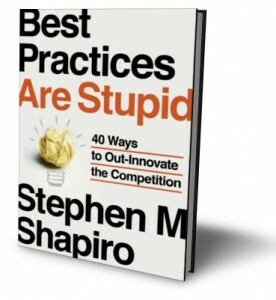 Stephen Shapiro is one of America’s foremost innovation advisers, whose methods have helped organizations like Staples, GE, Telefonica, NASA, the U.S. Air Force, and USAA. he teaches his clients that innovation isn’t just about generating occasional new ideas; it’s about staying consistently one step ahead of the competition. Hire people you don’t like. Bring the right mix of people to unleash your team’s full potential. Don’t think outside the box; find a better box. Instead of giving your employees a blank slate, provide them with well-define parameters that will increase their creative output. Failure is always an option. Looking at innovation as a series of experiments allows you to redefine failure and learn from your results. The Goldilocks principle. Challenges can’t be too big or too small. They must be “just right” to maximize the likelihood of a workable solution. Learn from Indiana Jones. Real treasure can be found when you leave your office, don your fedora and bullwhip, and study customers with your own two eyes. Use the reality TV show model. Competitions are as much about generating buzz and stimulating interest in innovation as they are about finding specific solutions.